The best thing I bought this summer was a basic white tee. You would say it's just a white t-shirt but there is so much more! Not every white t-shirt is good, you have to be picky and get 'the right' one. It's a substitute for fancier shirts which could make outfits too polished and substitute them with cotton shirts you avoid overdressing. I can wear them under dresses in winter or tucked them in skirts/pants with blazers on top to keep me warm. Mine is from man's department. It's a bit loose and the cotton has some weight to it. It is a little boxy but not too oversized so it's long enough to tuck in (because I tuck in everything) but not as long to look like a nightgown, I find it to be all around perfect for me. 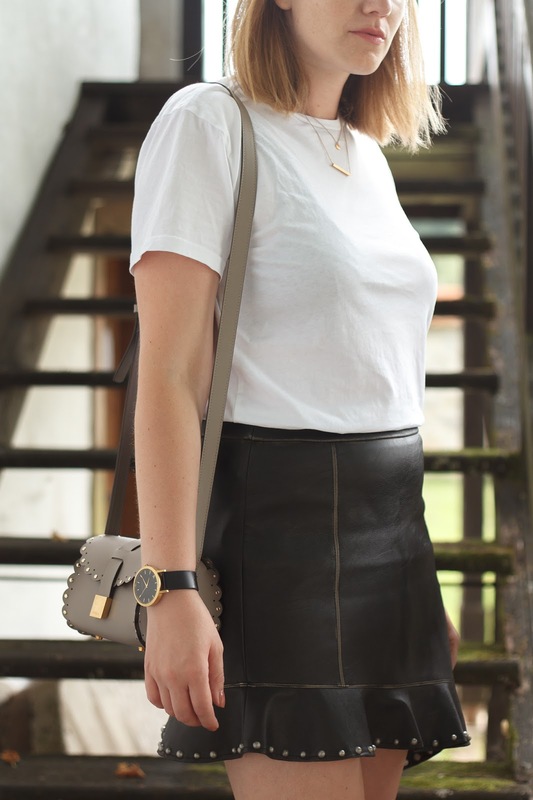 White tee could be a feminine, pretty and elegant piece, it all goes down to the styling. I think it blended very well with a faux leather skirt matched with Michael Kors sandals and the very last but not the least touch is my sale catch bag from Furla.